*"A Tale from the Wood"
*"Don't Sleep on Main Street"
*This series is continued from Gobbledygook (Vol. 1) #1. 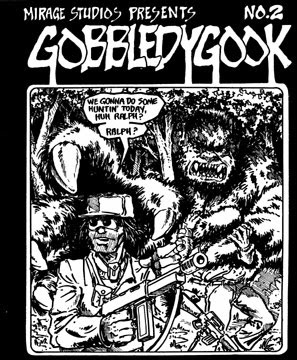 A "tribute" oneshot would eventually be published as Gobbledygook (Vol. 2) #1. *As with the first issue, this comic was printed on Xerox paper, stapled down the middle by hand and limited to a print run of 150 copies. It is also notoriously easy to counterfeit. *"Fugitoid, Chapter 3" and "Fugitoid, Chapter 4" were reprinted in Fugitoid (microseries) #1. *"Don't Sleep on Main Street" and "Only a Loser" were reprinted in Gobbledygook (Vol. 2) #1. *The back cover features an ad for TMNT (Vol. 1) #1. Aside from that, there is no TMNT content to speak of. Again, I don't own this comic and likely never will. I've included it here for the sake of completion, as it contains the first publications of the Fugitoid serial that wound up being worked into the narrative of TMNT Volume 1.